Ultra Electronics AEP’s TrustBox is an Android application that uses TrustChip® encryption to securely store files in the cloud. 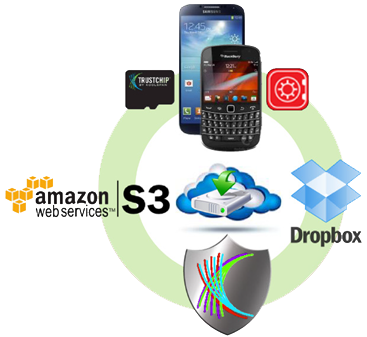 TrustBox can store encrypted files on Dropbox, Amazon S3, or directly within a device’s storage. TrustBox leverages the TrustChip® cryptographic hardware and proprietary software to eliminate the risk of data intercepts across the carrier infrastructure. When a TrustChip® enabled device attempts to upload or download data via TrustBox, data is encrypted and transmitted over a secure data channel. Utilising push technology to notify users of incoming communication. Provides secure data transmission between TrustChip enabled devices and Dropbox, Amazon S3, or a device’s local storage.